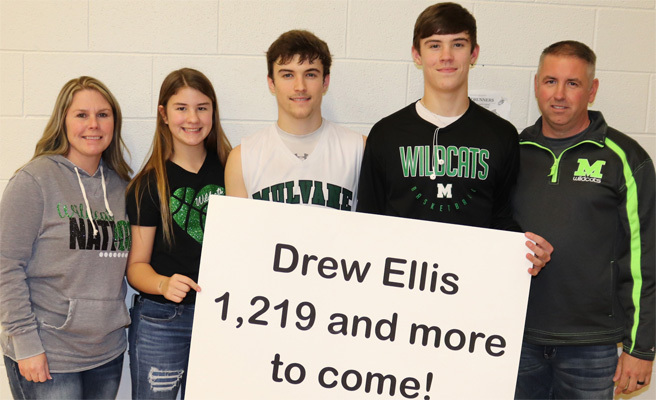 Friday, Jan. 18, 2019, at the 48th Annual Roadrunner Classic in Chaparral High School, Sr. Drew Ellis, became the all time leading scorer in Mulvane High School Boys Basketball history, breaking Jerry Webster’s record of 1,218 points. Playing the tournament host, Chaparral Roadrunners, Ellis was three points short of breaking the record going into the second round match-up, and the Wildcats went directly at the record in their first possession with Ellis just missing a three pointer at the top of the key, after running a designed play just for him. Three minutes into the game, down 2-0, So. guard Trey Abasolo calls out “91-Drew”, an isolated backdoor layup for Ellis. And Ellis finishes with ease to tie the record, 1,218. For a brief few moments of a basketball game, there were two scoring leaders on top of the record boards, Webster and now Ellis. With the scored tied, 8-8, and around the 2 minute mark of the first quarter, Abasolo decides to dial up the same isolation play for Ellis again, if it ain’t broke, run it again, “91-Drew”. So with a dead ball after a Roadrunner turnover, and the cats going the full length of the court, So. Canon Smith in-bounds the ball to Abasolo. He surveys the team to make sure everyone is in their spots while calling out, “91-Drew”. Jr. Gage Gerlach is out wide on the left wing, Jr. Michael Manis is in the left corner. Smith fills the left elbow late after sprinting down the court. Abasolo slightly drifts towards the right side of the court where Ellis is waiting at the right elbow. Abasolo crosses over taking the ball towards the left elbow and where the rest of the Wildcats are positioned, clearing out the entire right side of the court, leaving Ellis isolated with the Chaparral defender, No.12, Mace Atkins. Abasolo jump stops, reverse pivots to Ellis and gives a hard ball fake that Atkins bites on. Ellis plants and cuts back door towards the rim. 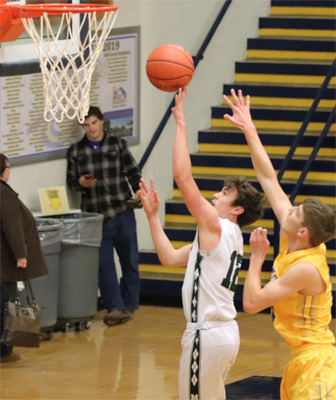 And with a simple bounce pass to the rim, Ellis simply catches and finishes with ease to take over as the all time leading scorer in basketball history at Mulvane High School. Abasolo to Ellis for 1,220. Head Coach Mike Abasolo quickly takes a timeout for the team and fans to celebrate the achievement. The bench rushes the court and Ellis is met first by Jr. Hunter Dye in mid air with a body check, then by his teammates and his younger brother, Fr. Mason Ellis. But as in most everything Ellis does, he observes the moment, and quickly refocuses back the game at hand. 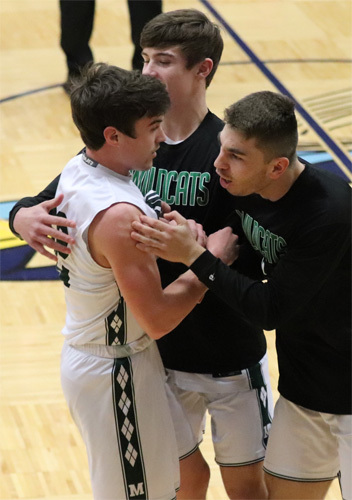 He doesn’t over do his celebration or expect the spotlight to be on him, He modestly accepts the favor and cheer of his teammates and fans, but just wants to go back to the game and compete, as he has done for four years and 1,220 points prior. Ellis is also the single game three point record holder with 9 and the career three point record holder with 154 and counting. There has been a lot of talk about Jerry Webster in the past couple of years when it seemed it was inevitable that his record would broken by Drew. 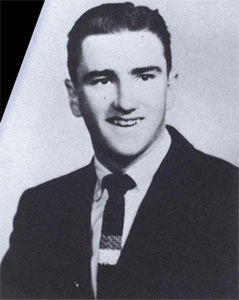 Jerry Webster was born in 1938 and was a standout athlete for Mulvane High School from 1952-53 to 1955-56. Jerry played football, basketball, track, and baseball. Since Mulvane did not have a high school baseball team yet, he played on many Wichita baseball teams including the Joyland Giants, Boeing BoJets, and Boeing Bombers. 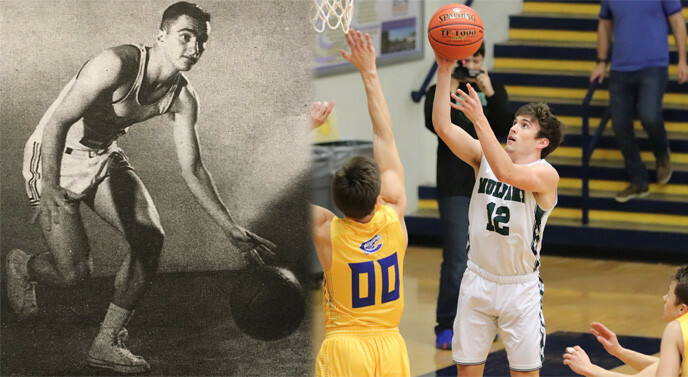 He scored 532 points in basketball his senior year and finished his career with 1218 points (without the 3 point line). He went on to play basketball and baseball at Oklahoma State and he went on to play professional baseball in the Minor Leagues. In 1959 he played for the Reno Silver Sox which was affiliated with the LA Dodgers Organization. In 1960 Jerry played for the Kokomo Dodgers and Orlando Dodgers in 1960 which were both affiliated with the LA Dodgers Organization. He finished out his professional career in 1961 with the Kokomo Dodgers before injury ended his baseball career. He played Second Baseman, Third Baseman and Shortstop. 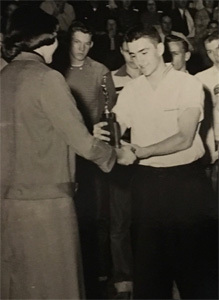 He played second base for the NBC Tournament Teams Rapid Transit Dreamliners and Service Auto Glass when they won National titles in 1962, 1963, and 1964. Jerry became a teacher and coached football (assistant) and basketball (head) at Mulvane High School for some years. He became the acting principal in the 1970-71 when principal Lyle Couch was diagnosed with a brain tumor. He remained the principal of MHS until 1973. Jerry was also a high school principal at Peabody, KS High School and Neodesha, KS High School. Jerry finished out his teaching career as superintendent for the Neodesha School System. He served on the Kansas State High School Activities Association Board of Directors and was President of the United School Administrators of Kansas in 1992. In 2003, the Wichita Eagle listed him as one of the all time best athletes from Mulvane. Jerry retired to Independence, Kansas where he played golf, fished on Beaver Lake, Ark., built furniture in his workshop and enjoyed watching his six grandsons play sports. He sadly passed away in 2013.